Carly McAskill is a researcher, visual artist, teacher and writer. She is passionate about the arts and culture, intergenerational pedagogies, research-creation, memory studies, motherline research, feminist pedagogy, arts-based methodology, storytelling, disability and age studies. As a visual artist, McAskill communicates through intricate mark making using mixed media, drawing, painting and collage. The multi-layered images in her work explore identity through meditation on place, time, presence, and inheritance. 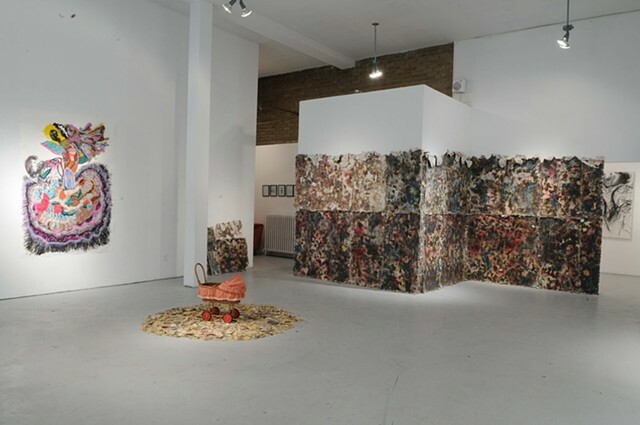 McAskill believes in the powers of representation through collage: “the fragments are significant as they become a tool to tell a story and reflect a pattern.” Also, the use of flowers in her work act as metaphorical subject matter that addresses emotions and issues around memory, history and identity. McAskill holds a Bachelor of Education in the Intermediate/Senior Division with Visual Arts and Religion teachable from Nipissing University (2014-2015), Master of Fine Arts in Visual Arts from York University (2011-2013), Bachelor of Fine Arts in Drawing and Painting from OCAD University (2008-2011) and Bachelor of Arts in Religious Studies from McMaster University (2004-2008). Additionally, McAskill is the recipient of the Alumni of Influence Trailblazer Award (2017) and the Mrs. W.O. Forsyth Award (2011) from Ontario College of Art and Design University. Currently, McAskill is completing her Doctor of Philosophy degree in Communication Studies at Concordia University. She is the recipient of the Ageing + Communication + Technologies (ACT) Doctoral Fellowship; ACT Scholarship for Graz International Summer School SEGGAU as well as Faculty of Arts and Social Science Graduate Fellowship in Ethnic Studies and Social Diversity Award at Concordia University. McAskill’s current research uses her art and research background in memory, identity, storytelling, collage and drawing to lay the foundation for her PhD research-creation project that focuses on making deeper connections with people with Alzheimer’s disease and dementia.